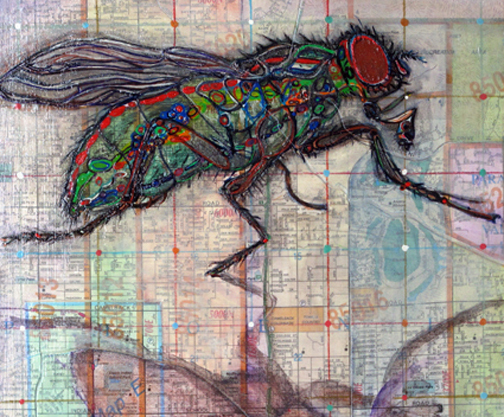 Today I am a fly – it’s all I could think while painting the one image below. From the start of this bug series, I want to paint a house fly. Here is what I know: flies carry over 100 pathogens, they feed on liquid or semi-liquid substances besides solid material (softened by saliva or vomit), and they deposit feces constantly, their entire body is covered with hair (like) projections, and the female is bigger than the male. Jeff Goldblum and Geena Davis come to mind. I work on the small 8 x 8″ for a good while, but it’s good to be done. I don’t want to be a fly anymore. Below is a detail of the grasshopper I painted. I don’t know why I didn’t post it before. I painted it for its symbolic association – one who has much to learn. I also learn I should always photograph a work before I varnish it, otherwise the sheen interferes. Certain I was only going to make 4 works for this invitational exhibition. 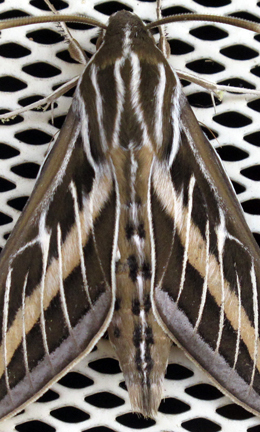 I woke up early to organize this post and when I open my front door, this sits on the screen at eye level – a beautifully symmetrical moth – I am told it’s a hawk moth. Has it arrived to be drawn? I wonder. While contour line, pattern and texture of the insect are alluring, I would want to include its anatomy. That seems like a challenge. I’ve already gotten back to my figure studies, but this bug show is not for a good while. I have a few more small panels. I might find time for another bug. This entry was posted in art, art exhibit and tagged anatomy study, art, bugs, casein, grasshopper, hawk moth, house fly by monica. Bookmark the permalink.